Phew, what a second-half goalfest that was. And hopefully all those league permutations made more sense to you than they did me. I'm off to have a lie down. Join us again tomorrow for a more sedate, one-match live text as Premiership leaders face Dundee United. The first-ever SPFL play-off between the Highland League champions Brora Rangers and Edinburgh City ended all square at Meadowbank Stadium. Former Slavia Sofia striker Ortega Deniran gave City the lead after 57 minutes, but Martin McLean equalised for Brora with 11 minutes remaining. All to play for in the Highlands next weekend as they battle to face Montrose in the play-off final. In League Two, East Fife have almost secured the final promotion play-off spot after their 3-0 defeat of Berwick Rangers. Elgin City's hopes ended with an amazing 5-4 home defeat by Annan Athletic, who need to win their final game and hope that East Fife lose heavily on the final day to reach the play-offs. Brechin City secured their promotion play-off place in League One after coming from two goals behind to draw away to Stenhousemuir. That result means that Stenny drop to second bottom and face the prospect of a relegation play-off after being overtaken by Ayr United after their 4-0 hammering of already doomed Stirling Albion. In League Two, the headlines are that Forfar take over at the top after dismantling disintegrating Dunfermline 3-1 at East End Park. However, Stranraer and Greenock Morton, who started the day first and second, have the chance to go to the top themselves as they face one another in the game just kicked off, with the action live on BBC Alba. "It was excellent. The players take a lot of credit. "We will keep trying the best we can, we still have the belief and you never know. "Everybody writing us off, the shackles were off and I told them to play with that freedom. "With some of the young boys coming in, we had that bit of enthusiasm. "Hopefully we can get four wins and we'll see where that takes us." At the bottom of the Championship, everything is going Livingston's way after their 4-0 hammering of Raith Rovers, Alloa's defeat by Hibs and Hearts' late winner away to Cowdenbeath. Livi are now off the bottom, ahead of Alloa on goal difference and a point behind the Blue Brazil, with their two rivals facing one another next weekend as Livi host Queen of the South. Queen of the South's 2-1 win over Dumbarton secures the Dumfries side's place in the play-offs. At the moment, it looks like they will face Rangers in that two-leg affair. At the top of the Championship, Hibs climb to second by hammering Alloa 4-1 and a win at Falkirk would secure their place in the play-off semi-final. Rangers are now third after their disappointing 2-2 draw at home to the Bairns and Stuart McCall's side need to win away to Hearts next weekend and hope Hibs slip up if they are to move back into second. Kilmarnock could yet be dragged into the relegation play-off place and remain seven points ahead of second-bottom Motherwell after that 4-1 hammering by St Mirren. The bottom-of-the-table Buddies have suddenly come to life, but it is likely to have come too late, although they do edge to within seven points of Well after that excellent victory. Partick Thistle leapfrog Kilmarnock into eighth place and that 2-1 win in Dingwall looks to have secured the Glasgow side's place in the Premiership next season. Ross County's nine-game unbeaten run comes to an end in a performance that was devoid of ideas and of few chances for the home side. The Dingwall outfit are six points ahead of second-bottom Motherwell and that could give some renewed hope for the side who lost at Hamilton last night as they look to avoid a play-off place. That defeat for Inverness allows St Johnstone to move to within four points of the side sitting third in the table after the Perth side's 2-0 win at Dundee. The Saints have leapfrogged Dundee United, who are away to leaders Celtic tomorrow, while Dundee's dream of Europa League qualification seems to have disappeared and Paul Hartley's side remain in sixth. "We knew the significance of winning today, but it will take an absolute collapse for Celtic not to win the title now. "Inverness showed exactly whey they have been so consistent. "They were excellent in the first half and our goalkeeper has done well to keep us in it. "The conditions benefited the team with the wind and we showed the desire and will to win we've had this season. "At no point did I think we were going to lose the game because I know the boys." "I feel for the boys. We were good entertainment today and it just wasn't to be. "I thought we were the better side in the first half and would go on and win it after taking the lead. "But that's what Aberdeen have got. Their status demands that they dig it out. "They always seem to be able to pip us at the post." Rangers salvage a point, but it is not enough to prevent Hibs leapfrogging them into second spot with one game of the Championship season remaining. Breathtaking stuff at Ibrox and the players are booed off the pitch despite their two-goal comeback. A dramatic finish at Ibrox as Rangers have three efforts cleared off the line before Nicky Law forces home his 13th goal of the season. Aberdeen's comeback from a goal behind ensures that Derek McInnes' side are assured of at least second place. They still have outside hopes of the title too and move back to within five points of leaders Celtic, who play Dundee United tomorrow. Brad McKay looks to have won it for champions Hearts from the penalty spot in the dying seconds. Rangers have been knocking on the door and on-loan Newcastle United midfielder Haris Vuckic flicks into the net to give the Ibrox side some hope of a comeback. Donald McCallum exploits a gaping hole in the Queen of the South defence to pull one back for Dumbarton. Scott Brown has to tip over Gary Warren's header as Inverness come forward searching for the equaliser. Lee Ashcroft's header strikes the post as Kilmarnock push for some consolation at St Mirren Park. Queen of the South are poised to secure the play-off place as Stephen McKenna curls home their second in Dumfries. Dominique Malonga provides the finishes after Jordon Forster heads into his path against Alloa. Aberdeen have turned it round at Caledonian Stadium as Niall McGinn follows up the rebound after Adam Rooney's initial effort and buries the ball into the net. Alloa reduce the arrears at Easter Road as Iain Flannigan's effort beats goalkeeper Mark Oxley. St Johnstone take control at Dens Park as David Wotherspoon shot goes in off Iain Davidson's heel. Hibs in control and seemingly heading into second place as Dominique Malonga races onto a pass before setting up Jason Cummings for his 17th league goal of the season. Niall McGinn's free-kick looks like it was meant as a cross rather than a shot, but everyone misses it and it ends up in the net. Rangers' hopes of finishing runners-up are disintegrating at Ibrox as Falkirk break clear and scorer John Baird sets up former Hibs midfielder Tom Taiwo to finish. Steven Thompson scores his second penalty of the afternoon, striking it more sweetly than he did previously, as Killie's villain was again Manuel Pascali, this time for a foul on James Dayton. John Baird fires Falkirk into a surprise lead that silences the big crowd at Ibrox. It might be too late for the Bairns in their search for a play-off place, but they have delivered a blow to Rangers' hopes. Queen of the South have been fairly subdued against Dumbarton but are suddenly ahead through Kevin Holt as they edge closer to a play-off place. St Mirren captain Stephen Thompson restores their two-goal lead despite a miss-hit spot kick after Manuel Pascali was pulled up for a foul. Ryan Esson makes a great save to deny Ryan Jack as Aberdeen try to hit back, then the Dons want a penalty when a tackle brings down Jonny Hayes, but referee Crawford Allan waves away the claims. Partick Thistle full-back Stephen O'Donnell sends a shot from the right flying into the back of the net. Danny Swanson curls a shot past goalkeeper Scott Bain from the edge of the box to give Saints the lead. Kilmarnock make the breakthrough after a spell of pressure after the break as former St Mirren striker Josh Magennis sends a dipping 20-yard drive past the goalkeeper. Lyle Taylor squanders a good chance for Partick Thistle as the visitors start the better of the two sides in Dingwall. It's a third goal in three games for Edward Ofere. The initial header bounced off the chest of goalkeeper Scott Brown, but the Nigernian striker manages to clip the ball into the net. We're back underway at most grounds around Scotland in what could be an exciting - and significant - 45 minutes around the country. Sorry for the lack of action from Dens Park due to communication issues. It has been a fairly subdued affair it seems, but the home side have had the better of the chances. St Johnstone goalkeeper Alan Mannus tipped a Paul McGowan shot over the the crossbar, while Frazer Wright cleared off the line from Paul McGinn. Liam Craig side-foots into the net to put Hibs in control as the home side look to leapfrog Rangers into second place in the Championship. It's a third chance for Marley Watkins, but this time it's the most difficult of the three and the Inverness winger puts it over the bar. Adam Rooney, who 27 goals has led to a PFA Scotland player of the year nomination, sends a header over the bar. Are Inverness going to be made to regret not taking advantage of a dominant opening 40 minutes? Alan Steele: "Game over for Motherwell - don't fancy any of the three in the play-offs." Callum Green: "Meekings is not suspended. Poor show by the SFA - he has only been booked three times." This one will run and run. 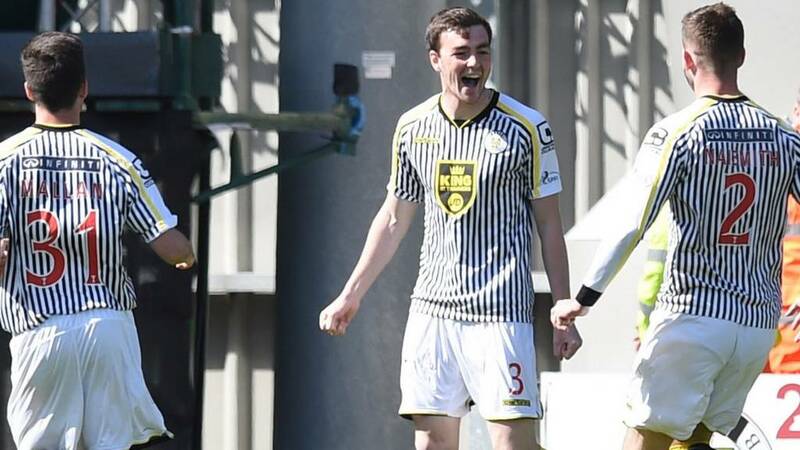 Nick Lloyd, Aberdeen: "What a potential turnaround for St Mirren! Makes an exciting end to the season. I think they have the team spirit to do it. (Shoutout to my mate Spikey who ran the Balmoral 10k in 42 minutes today!)." Advantage Hibs in the promotion chase at the top of the Championship as Martin Boyle fires them into the lead. Advantage Livingston at the bottom as they chase Alloa in the relegation zone. John Dorward: "Josh Meekings was booked in last league game against Celtic. Seems it was a one-game ban due today from the totting up of six yellows. Yogi plays a banned player." Oh dear, the Meekings saga continues and it might have an unhappy ending for Caley Thistle. "No no no no no no. You can't miss them opportunities. Incredible, incredible miss," says BBC Radio Scotland pundit Willie Miller after Marley Watkins spurns another chance for Inverness. Kieran Sadlier heads the Buddies into a two-goal lead from close range after Jason Naismith's initial effort was blocked. There had been initial thoughts that it was Thomas Reilly who got the final touch, but it is now been given to Sadlier. Nick Ross should put the home side ahead in Inverness. Scott Brown makes the save, but Ross was clean through and the midfielder knows he should have done better. Frederic Frans' poor clearance led to Ross County's opener, but the big defender makes amends with a powerful drive from long range. Anonymous: "Josh Meekings was booked in the league game versus Celtic and is suspended under the totting up procedure. Amazing how this has been missed. Yogi gets his banned player back and plays him when banned!!" That would be a turn up for the bookings! Tim - Elgin: "Big game in League Two next week - East Fife entertain Elgin. Could be a winner takes all!" Michael Gardyne fires Ross County into the lead against Partick Thistle after the striker pokes the ball home after Freddy Frans only half clears. Callum Fordyce puts Livingston into the lead as they battle against relegation. "Aberdeen are camped in their own half. Yes, the wind is a problem, but they should be doing better. Inverness are well in control of this game." The first save of note at Caledonian Stadium is by Dons goalkeeper Scott Brown. Good play by Ryan Christie sets up Marley Watkins, whose low shot is well caught. News at the top and bottom. Martyn Fotheringham has put title chasing Forfar ahead against Dunfermline. Stenhousemuir are 2-1 up against Brechin, while Ayr United are 1-0 up against Stirling Albion, a lead for the two sides trying to avoid the relegation play-off place. Raith Rovers striker Calum Elliot has been stretchered off in their match against Livingston. Apparently a knee injury for the former Hearts man. BBC Radio Scotland commentator Liam McLeod has just said: "The wind is crazy here." Sean Kelly pounces to fire St Mirren into the lead after a slack pass in the Kilmarnock defence. Has the great escape begun? There's an extended Sportscene spread over two parts this afternoon. It's just kicked off on BBC Two Scotland and switches over to BBC One Scotland at 16:30. You can watch it all here via the 'Live Coverage' tab. Former St Mirren midfielder Billy Davies is in the stand in Paisley. However, the former Nottingham Forest boss gave a strong "no comment" to reporter Kenny Crawford when approached about his interest in today's game. Davies has, of course, been linked with the job at St Mirren should Gary Teale not be kept on beyond the summer as boss. We are off around the country as the sun shines brightly around Scotland. It seems that Caley Thistle are going to go ahead with playing Josh Meekings in defence despite him being on the SFA list of suspensions. They are confident that he is not banned even though they appear to have not had clarification from the governing body. St Mirren manager Gary Teale says midfielder John McGinn suffered an injury in training on Thursday and it seems to be knee/thigh related. After Motherwell's defeat, Teale says "you never know" what could happen as they hope to make up the gap at the bottom and avoid relegation. He hopes his side are energised by that. With centre-backs Jim Goodwin and Viktor Genev suspended and Marc McAusland having been released after being troubled by a knee problem, St Mirren manager Gary Teale short of options at the back. Ross County make one change from the side that beat St Mirren, with Filip Kiss coming into midfield to replace the suspended Jackson Irvine. Partick Thistle are unchanged following their win over Motherwell 2-0, with James Craigen on the bench after returning from suspension. Alan David Duncan: "@AberdeenFC sorted for the win. @RyanJack22 runs the show, @jonnyhayes7 runs Caley ragged, @Willoflood8 kicks lumps." "We've done well against Inverness but we've never had anything but a hard game and had to play well to win. "They have done exceptionally well and theirs' is a great story. "But hopefully we can play well against them again and clinch second spot - that's our aim for the day. "Aberdeen haven't been second for 21 years and a win today gets us that. "We never felt that Celtic would slip up. We've improved, but it's still not been enough to close that gap." St Mirren: Ridgers, Naismith, Baird, Tesselaar, Kelly, Reilly, Dayton, Mallan, Wylde, Sadlier, Thompson. Subs: Gow, Arquin, Brown, Sonupe, Kello, Morgan, Cuddihy. Kilmarnock: Samson, O'Hara, Pascali, Ashcroft, Barbour, Johnston, Clingan, Slater, Obadeyi, Magennis, Eccleston. Subs: McKenzie, Miller, Cairney, Brennan, Eremenko, Kiltie, Syme. Inverness officials are frantically calling the Scottish FA after spotting that Josh Meekings' name is on the parent body's list of suspensions for today. The club think the defender is not banned for the match against Aberdeen. Ross County: Brown, Fraser, Boyd, Paul Quinn, Reckord, Gardyne, Kiss, Woods, De Vita, Boyce, Curran. Subs: Reguero, Rocco Quinn, Saunders, Cardle, Sernas, Palazuelos, Dingwall. Partick Thistle: Fox, O'Donnell, Frans, Balatoni, Booth, Osman, Bannigan, Lawless, Higginbotham, Taylor, Stevenson. Subs: Craigen, Doolan, Gallacher, Elliot, Richards-Everton, Fraser, Wilson. Dundee: Bain, Paul McGinn, Konrad, McPake, Dyer, Stewart, Thomson, McGowan, McAlister, Heffernan, Clarkson. Subs: Letheren, Davidson, Tankulic, Black, Wighton, Harris, Stephen McGinn. St Johnstone: Mannus, Mackay, Wright, Scobbie, Wotherspoon, Swanson, Davidson, Millar, Miller, Graham, MacLean. Subs: Banks, Caddis, McFadden, Brown, Easton, Kane, O'Halloran. Inverness make one change from the side that beat Celtic in the Scottish Cup semi-final, with Nick Ross replacing the suspended Ross Draper. Aberdeen were without the suspended Barry Robson and he is replaced with Ryan Jack at the centre of midfield. Inverness CT: Esson, Raven, Warren, Meekings, Shinnie, Ross, Tansey, Christie, Williams, Ofere, Watkins. Subs: Vincent, Doran, Devine, Tremarco, Polworth, Kink, Mackay. Aberdeen: Brown, Logan, Taylor, Reynolds, Considine, McGinn, Flood, Jack, Hayes, McLean, Rooney. Subs: Langfield, Smith, Pawlett, Goodwillie, Low, Shankland, Daniels. Brora return to the scene of their 3-2 Scottish Cup fourth-round win in November. Edinburgh, 21 points clear at the top of their league, warmed up with a 5-1 win over Selkirk, while Brora, who are 14 points clear at the top of the Highland League, had a 2-0 win over Rothes to stretch their unbeaten league run. Don't forget that history is being made at Meadowbank Stadium, where Edinburgh City host Brora Rangers in the first leg of the first-ever play-off for a place in the Scottish Professional Football League. The Lowland League champions will travel north for the second leg against their Highland League counterparts next Saturday. The aggregate winners will take on Montrose, who have already finished bottom of League Two, in another two-leg play-off. In League Two, East Fife have a chance of securing the final play-off spot - if the Fifers defeat Berwick Rangers and Elgin City and Annan Athletic draw. However, Elgin and Annan can move into fourth with victories if the Fifers lose to Berwick, who themselves still have an outside chance of a play-off spot. Fourth-placed Brechin City will make sure of at least a play-off place with a point or more against Stenhousemuir. Even if City lose, Airdrieonians must win away to Peterhead to keep their own hopes alive until the final game. Returning to League One, a win for Morton over leaders Stranraer will take them top of the table, while Forfar can also go top of the pile if they win at East End Park while the other two draw. Back to the Championship for a moment, Falkirk boss Peter Houston has told BBC Scotland's Chick Young that he is not unhappy that Josh Meekings is free to play against his side in the Scottish Cup final. "For me, it would be 100% wrong if action had been taken for a hand ball after the game," he said. "For him to miss it because of that, I would have been gutted for the lad." In League One, leaders Stranraer can clinch the title and the one automatic promotion spot if they defeat second-top Greenock Morton and third-placed Forfar Athletic lose away to Dunfermline Athletic. At the other end of the Championship table, Livingston will be consigned to at least a play-off to avoid relegation if Cowdenbeath beat Hearts and Alloa defeat Hibs, although those are unlikely scenarios. However, Livi will move above Alloa and off the bottom of the table if they win away to Raith Rovers and the Wasps lose at Easter Road. Queen of the South will all but secure their place in the play-offs with at least a point at home to Dumbarton. If the Doonhamers slip up, Falkirk must win their next two games, away to Rangers today and then at home to Hibs, to retain hope of finishing fourth above the Dumfries oufit. Down in the Championship, Hibernian must avoid defeat against relegation-threatened Alloa Athletic to retain any hope of preventing Rangers finish second should the Ibrox side defeat Falkirk. The Edinburgh side can overtake Rangers if they win and the Glasgow outfit slip up at home to the Bairns. Kilmarnock boss Gary Locke also rings the changes, with Ross Barbour, Chris Johnston, Nathan Eccleston and Manuel Pascali coming in for David Syme, Darryl Westlake, Paul Cairney and Lee Miller. St Mirren manager Gary Teale makes five changes, with Jack Baird, Jeroen Tesselaar, Thomas Reilly, James Dayton, Kieran Sadlier replacing Marc McAusland, Viktor Genev, John McGinn, Yohan Arquin and Jim Goodwin. In the bottom six, Ross County host Partick Thistle looking to continue their fine run and move further clear of a play-off pace. A win for the Dingwall side and they would leapfrog the Glasgow side, who themselves are not clear of relegation trouble. In the other top-six Premiership game, Dundee host St Johnstone in the race for Europa League qualification places. Sixth-top Dundee can move to within a point of today's opponents with a victory, while Saints can leapfrog Dundee United. "The boys have been outstanding, to get into the top six again and a national cup final. "The case against Josh Meekings put a wee dampener on it, but once he got the decision and was back at training, we were back to business. "There was justice done. With retrospective action, I thought England were going to get back in that World Cup for Maradona's hand ball. "It was obvious the SFA could not going to win the case, so why did they go through with it? "With the luck Josh is carrying, I wouldn't be surprised if he scored today. "Aberdeen are an excellent team and, if we are to have any chance of catching them, we have to win today." With second-bottom Motherwell having lost 2-0 last night at Hamilton, St Mirren might just be rethinking the mood of acceptance around the Paisley club about their relegation fate. A win over Killie and they will move to within seven points of Ian Baraclough's stuttering side with four games remaining. Could an unlikely great escape start today? Give us your thoughts on that and any other issues during another controversial week in Scottish football. Tweet #bbcscotfootball, text on 80295 or comment on the BBC Sport Scotland Facebook page. "As if St Mirren's problems are not numerous enough at the bottom of the Premiership, we can reveal that midfielder John McGinn will miss their match against Kilmarnock through injury. It's not yet been confirmed what the problem is, but he has arrived at the stadium in Paisley on crutches." Inverness are definitely battling the statistical gods, with Aberdeen unbeaten in six games and seeking their third straight victory. The Dons are unbeaten in their last three visits to Caledonian Stadium and are looking for their fourth consecutive win this season over Caley Thistle, who have not beaten Aberdeen in their last five meetings. How will Inverness Caley Thistle players react after the high of their Scottish Cup semi-final victory over Celtic - and the low of having Josh Meekings all over the back pages as he faced a potential suspension for a controversial hand ball missed by the match officials? Of course, the Englishman won his case and is clear to play in the final, but one wonders what his frame of mind - and that of fellow defender Gary Warren, who will miss out at Hampden through suspension - might be for today against Aberdeen. With leaders Celtic playing Dundee United for the umpteenth time this season tomorrow, the Premiership focus falls on Aberdeen. The Dons still have a chance of the title itself, of course, but they can secure at least second place with a draw or better away to third-placed Inverness Caledonian Thistle. Hello and welcome to what is, these days, an abnormally late start to the Scottish football action on a Saturday. Don't worry, there was no long lie for the wicked and I've been up with the dawn chorus trying to work out the various permutations as we reach the concluding stages of the promotion and relegation battles in the four senior leagues.